Are you wondering if your dog is getting everything they need? Maybe your dog seems to have anxiety and you just can’t figure out how to help them calm down. Have you been thinking about anti-anxiety supplements for dogs? 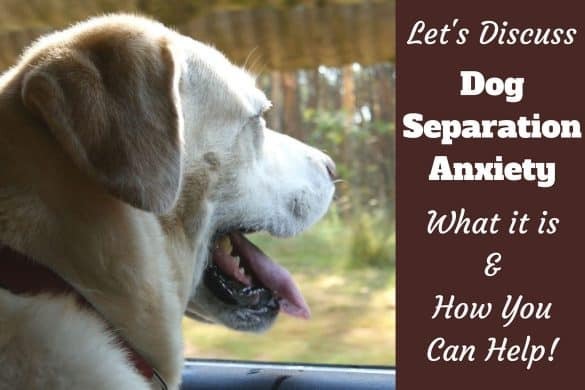 If you’re asking yourself these kinds of questions, then your dog is most likely suffering from anxiety, possibly caused by separation or just a variety of environmental factors. Of course, we all want our dogs to be in the best health and it can be extremely worrying when we notice that our four-legged friends are acting a bit off from time to time. So, if you’ve noticed that Rover has been having anxiety issues, or just needs to be a bit calmer, you might want to consider trying anxiety supplements for dogs? In the following article, we’re going to take a look at some of the best anti-anxiety pills for dogs. Are Anxiety Supplements Right for Your Dog? Most dog owners usually only turn to supplements when they want to improve upon the potential shortcomings of their food. 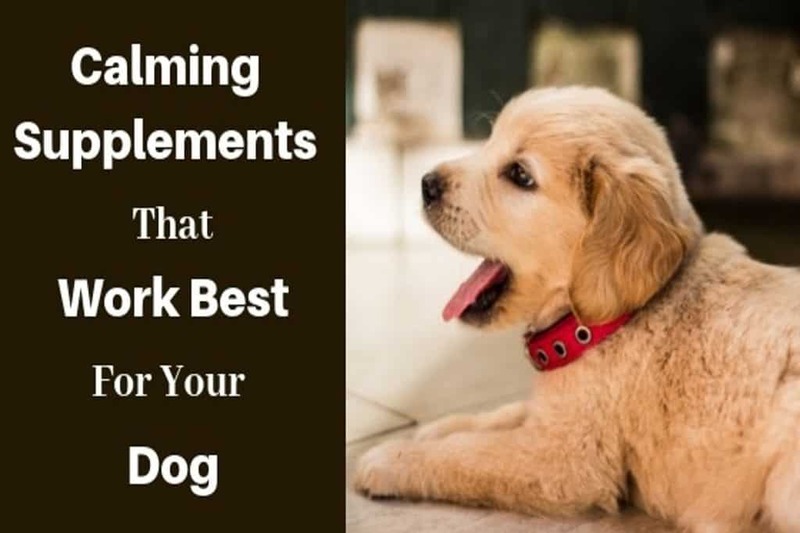 But the fact is that there are plenty of supplements on the market that are not only good for your dog’s health but they will also help your loyal pet deal with stress and anxiety and keep him or her much calmer throughout the day. In fact, a study in 2017 showed that just over two-thirds of all dog owner use some form of supplements for their dogs. However, it’s important that dog owners understand that there are sometimes concerns about the quality, safety, and efficacy of pet supplements. So, before you start your pets on any type of supplement, it’s best to speak with a veterinarian to make sure that the supplement you choose is right for your pet. Nevertheless, when used properly, supplements can be an important part of your dog’s overall healthcare regimen. 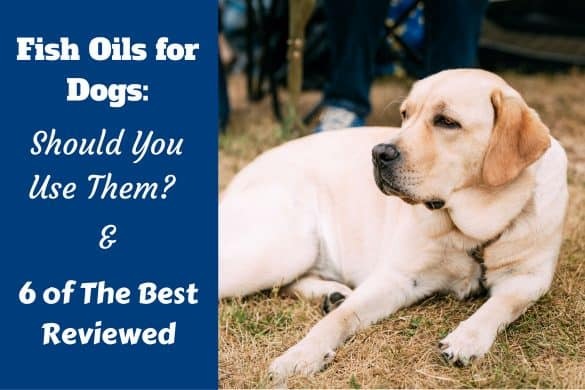 Below, we’re going to take a look at our top 5 favorite calming supplements to help your dog deal with stress and anxiety. Keep in mind that the best product for one dog might not be the best product for the next dog. So, always make sure to research an anxiety supplement thoroughly to make sure that it’s right for your dog. So, without further ado, let’s dig into our reviews. For dogs who often get nervous or anxious, NaturVet Quiet Moments Calming Aid Soft Chews are a must-have. This supplement is intended to help man’s best friend deal with any number of stressful situations. So, fireworks, thunder, long car rides, or visits to the vet won’t be an issue anymore. These soft, chewable supplements are loaded with L-Tryptophan and thiamine, which help reduce tension and stress for your pup. Furthermore, they also contain melatonin to help promote rest, relaxation, and overall better sleep. 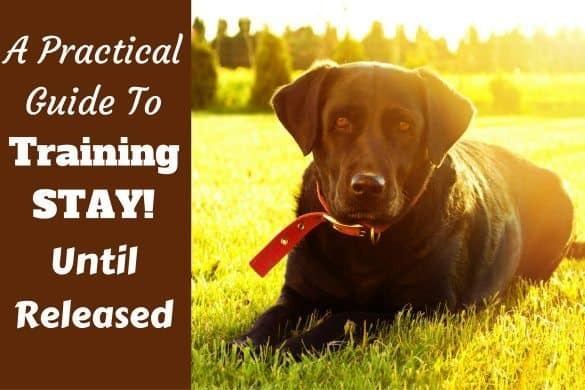 This supplement takes about half an hour to kick in, so you’re going to want to make sure to give one to your dog about 30 minutes before any type of stressful situation. Then, your pet will be sure to remain calm throughout the whole ordeal. Additionally, this supplement has ginger in it, which will help dogs that have sensitive stomachs. This makes this product ideal if you’re planning on traveling with your dog. Our next pick has a more advanced formula containing a complex variation of ingredients, not often found in other anxiety supplements. These ingredients are geared towards dogs who exhibit nervousness, stress, or anxiety; it also helps support well-balanced behavior. This supplement includes ingredients such as L-theanine, thiamine, and a veterinarian approved C3 Calming Complex formula. The product claims to start working in as little as 30 minutes and is meant to last for up to 4 hours depending on the size and breed of your pet. In other words, this supplement is designed to help alleviate your dog’s stress problems without affecting their energy levels, personality, or overall behavior. It is also designed to be used either daily or when needed prior to your pet facing any sort of stressful situation. Composure bite-sized chews are even safe to give your dog two to three times per day, in case they are facing a lengthy and stressful situation such as a long car ride. Finally, this supplement is approved by the NASC so you know that the product has been developed and tested to meet high-quality standards. These delicious, bite-sized chews are made with real turkey and are formulated with a unique blend of all-natural ingredients to help your dog feel calmer without making them feel drowsy or drugged-out. This anxiety supplement contains Suntheanine, which is a purer form of the amino acid L-theanine, which helps support stress-free rest and relaxation. These stress and anxiety bites also contain a few other notable plant-based calming ingredients such as organic hemp, vitamin B1, valerian root, chamomile, and L-tryptophan. This unique blend of ingredients makes this product ideal for dogs who are prone to aggressive or hyperactive behaviors or younger pups who are easily stressed-out due to separation anxiety or having to go to the vet. 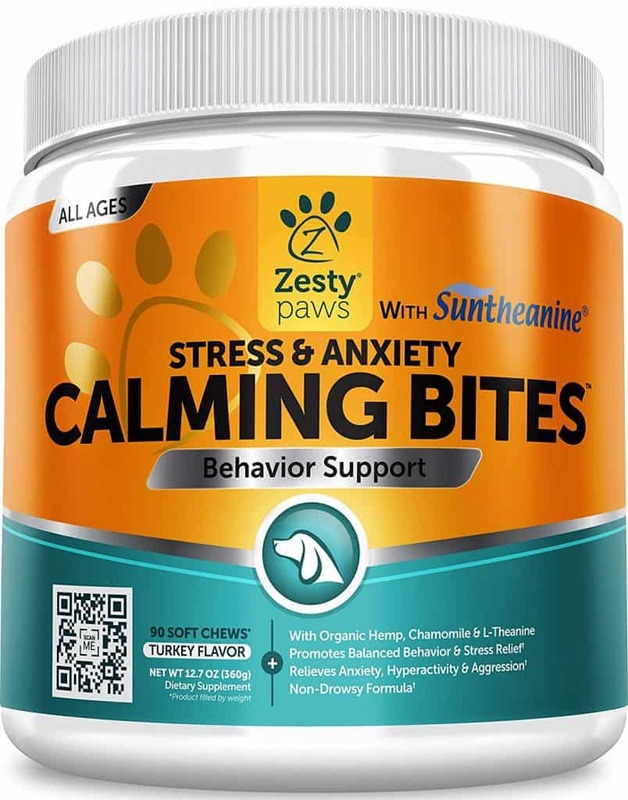 Finally, Zesty Paws’ Stress and Anxiety Bites are made with a combination of high-quality ingredients in a US-based, FDA-registered, and GMP (Good Manufacturing Practice)-certified plant. 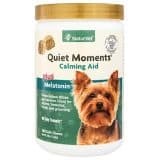 Our next calming supplement is made by a popular company, Rescue Remedy, who is known for manufacturing natural and safe stress-relief products for pets. Rescue Remedy’s Stress Relief Pet Supplement is made with an alcohol-free, homeopathic formula, which is recommended by vets to help calm your four-legged friend during any type of distressing situation. Therefore, it’s ideal for dogs who suffer from stress or anxiety during everyday events such as fireworks, thunderstorms, or being groomed. 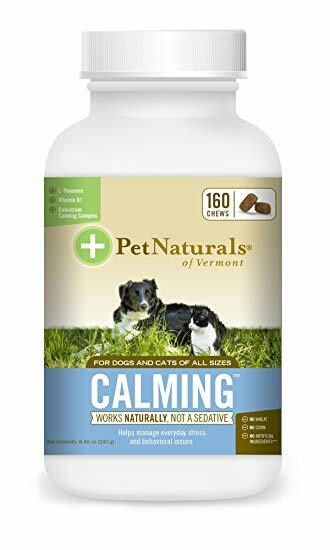 Furthermore, this supplement is also designed to help your pet stay calm after they’ve been through a stressful event. This product’s natural formula is made up of five calming flower extracts: Rock Rose, Star of Bethlehem, Cherry Plum, Clematis, and Impatiens. One other key benefit for this supplement is that it’s extremely easy to administer. All you need to do is simply use the dropper to add a few drops of the formula to your dog’s food or water dish. The final supplement on our list comes to you from Pet Naturals of Vermont. Their dog and cat calming supplement is designed to help keep your dog calm without using drugs or other sedation techniques. Furthermore, this product is designed to support the overall health and well-being of dogs of any breed, size, or age. This product was also designed to help your pet relax without causing a change in their personality. Simply give your dog one of these chewable bite-sized supplements prior to a stressful event and they’re sure to remain calm until everything is back to normal. These chews are delicious and formulated by veterinarians with ingredients that work to naturally support calmer behaviors. They are fortified with L-theanine, Vitamin B, as well as a colostrum calming complex, which has been known to reduce stress and support overall cognitive function. Of course, before giving your dog any type of supplement, it’s important to understand what the supplement will do to your pet. It’s also important to always check the ingredients in the following products to make sure that your dog doesn’t have any allergies to them. With that said, always keep in mind that the best anxiety supplements for dogs are not all created the same and that just because one product is more expensive than the other, doesn’t necessarily mean that it’s any better. Does the product claim to be organic or holistic? Always check the label and then reference the ingredients to see if the claim is true. Check for high-quality anti-anxiety ingredients such as melatonin, L-tryptophan, and thiamine, which are all known to help improve anxious or nervous behaviors. Check to see if the product has the NASC’s or National Animal Supplement Council’s seal of approval. Is the product manufactured in an FDA- or GMP-approved facility? Supplements are not usually needed for dogs or pets who eat a healthy, well-balanced diet. However, they can be extremely beneficial for dogs with certain medical conditions, including those suffering from high levels of stress or anxiety. Talking to your veterinarian is the best way to help you determine which is the best anxiety supplement for your dogs, as well as how often to give it to them, and which brands have the highest levels of quality control. These product reviews were intended to give you an idea of the best supplements on the market. However, if you’re thinking about giving your dog an anxiety supplement, it’s highly recommended to speak to your vet beforehand. 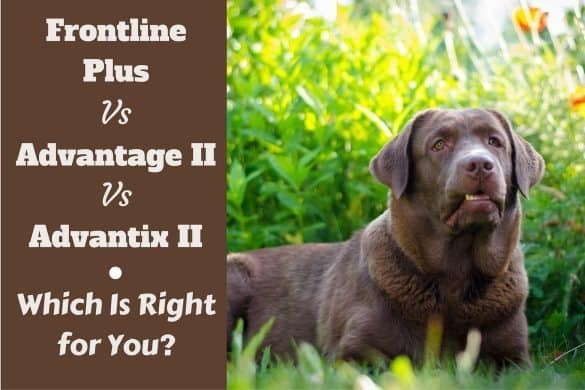 Frontline vs Advantix vs Advantage Flea – Reviews & Which is Best? 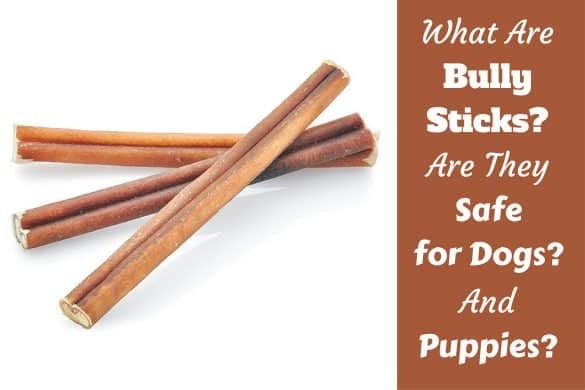 What is a Bully Stick? What are They Made of? Are They Safe?